Former Sun Queen's Park reporter Jonathan Jenkins has died following a battle with cancer, the Sun reports. The finalists are: The Canadian Press; CTV News; The Edmonton Journal and Calgary Herald (joint submission); The Globe and Mail; The Toronto Star; and The Windsor Star. "In my old life as director of communications to Prime Minister Stephen Harper, I would often quip that I would love to have had my job in the days before smartphones and the internet. With 700 to 800 emails and dozens of calls a day, the life of a modern political communicator is full-on, to say the least. "What must it have been like in the leisurely age of teletype, radio, the nightly broadcast and the next day's paper? No wonder hacks and flacks would get drunk together in the afternoon — they didn't have to worry about Twitter, Facebook, some crank's blog or filling up their website with reams of copy. And if people were behaving badly at the bar, or dipping their pens into each other's company ink, no one had access to the instant canvas of the internet to gossip about it. "In the pre-digital era, the days had a rhythm and the news had a cycle. Reporters had one broadcast or a set number of column inches. There were one or two wire services, and they — and only they — had the responsibility of banging out a quick blast on the latest news. "For CBC News on-air employees, we're tightening our procedures around paid speeches. We'll reject requests from companies, political parties or other groups which make a significant effort to lobby or otherwise influence public policy, even if the speech or event seems innocuous. "We're also going to centralize our tracking system for all speeches whether they are paid or not. This will help ensure that we apply our rules thoroughly and consistently. And we'll reinforce with our staff that all are accountable for understanding the rules and sharing this information. This will also apply to our radio current affairs personalities. And we're making another commitment to all Canadians that CBC News will be more transparent than ever before. "Starting in May, we'll post regularly online a list of appearances by our reporters and hosts -- both paid AND unpaid. This will allow you to judge for yourselves how well we're living up to our commitments." The new policy comes following a flap about Peter Mansbridge and others taking fees from various groups. "If you’re planning a trip to New York this spring, there is a treasure chest of Canadian memories at the Leica Gallery on Broadway," she writes. "The exhibit is called Ted Grant: Sixty Years of Legendary Photojournalism. It opens on April 24 and runs till June 7. "Although newspapers are still able to set the news agenda, they now have to come to terms with the fact that people have platforms that enable them to not only answer back but also switch the agenda. "So it was on Sunday when the Mail on Sunday was confronted by widespread anger across social media, notably Twitter, over its two-page article about food banks. The paper's "special investigation", headlined "No ID, no checks … and vouchers for sob stories: the truth behind those shock food bank claims", suggested that claims about the scale of Britain's welfare problems had been exaggerated. . . .
"Reaction against the MoS's anti-food bank message was swift. The Twittersphere hummed with anger as people argued that the article discredited the mission of food banks to help the poor. One tweet said: 'No, no Daily Mail [sic]. The scandal isn't that food bank volunteers didn't check your cretins' ID. The scandal is that food banks exist at all.'" 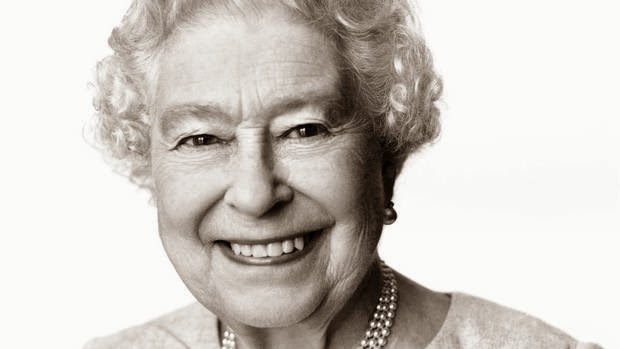 A portrait of Queen Elizabeth II by renowned British photographer David Bailey has been unveiled to mark the monarch’s 88th birthday. The story doesn't say whether the photo was taken or film or digital media. J-Source reports that the Toronto Star announced it will hire eight digital journalists who will be paid less than other journalists in the newsroom and it is considering another round of editorial buyouts. The newspaper also laid off 11 full-time page editors and eight staff in the circulation department. The union said it is most concerned about the digital hires, which it said would result in a two-tiered pay system, with digital-only reporters paid approximately $200 less per week than an entry-level Star reporter. Shaw Communications plans to lay off 400 employees in order to streamline their cable, satellite, Internet and home phone services into two units for consumers and businesses, the company announced. The layoffs affect about three per cent of their workforce, which includes jobs at the Shaw Media division, which runs the Global Television Network and Shaw’s specialty TV channels including Showcase and HGTV Canada. Call centres and installation service jobs are expected to be unaffected by the cuts. “We are eliminating duplication of work and organizing our activities and operations in a way that best meets the needs of our customers and viewers,” CEO Brad Shaw said in a statement. Shaw, which began its existence as a cable-television company in Edmonton in 1966, said they plan to hire up to 100 people in areas of the company that are growing such as marketing and next generation products. The company has roughly 14,500 employees across its operations and delivers services to about 3.2 million customers in Canada. Shaw Media’s TV channels include Action, DIY Network Canada, BBC Canada, Deja View Canada and Slice. Last week, Shaw reported that profits improved to $222 million in the second quarter, helped by the sale of its stake in French-language cable channels Historia and Series+ to Corus Entertainment. Robyn Doolittle joins the Globe! Toronto Star City Hall reporter Robyn Doolittle is joining The Globe and Mail as an investigative reporter, j-Source reports. Doolittle is one of three journalists who has seen the infamous video of Mayor Rob Ford allegedly smoking crack cocaine and the author of Crazy Town, a book on Ford and his family. Editor-in-chief David Walmsley said in a memo that Doolittle will join the Globe later this month. The theft announced this morning of 900 social insurance numbers (SIN) from the Canada Revenue Agency computer system is a story about the Heartbleed bug, but it is also a media story. It appears clear that the theft of these numbers occurred after the enormous furore in the media alerted hackers to the opportunity for such theft, and before CRA responded by shutting down access to the machine. The whole thing occurred during a six-hour period after the security flaw was discovered. Andrew Treusch, Commissioner of Revenue at the agency, said in a statement the CRA is currently investigating the removal of other data, some of which "relate to businesses." No other information was immediately available. The circumstances of the theft raise again the timeless question of just when the public good is actually damaged by the unrestrained broadcast of such news. Historically, we always come down on the side of instant dissemination, and this may indeed be the right choice. But there is no doubt that the mad release of all information instantly can be a mixed blessing, related as much to making money as it is to the public good. The Heartbleed case is a good example of the former. This previous post notes how harmless the software flaw remained as long as it lay quietly unreported. How much smarter it would have been to fix Heartbleed first, if possible, before announcing to the general public that the flaming disintegration of the cyber-world as we knew it was at hand. This year’s mayoral front-runners have backed out of a debate planned for Monday on a community radio station, citing a lack of organization, the Star reports. The debate was to be held on University of Toronto radio station CIUT 89.5. Many observers were surprised when long-shot candidate Sarah Thomson was invited but not Karen Stintz or David Soknacki. But Saturday night, the campaigns of mayor Rob Ford, Olivia Chow and John Tory issued a joint statement saying they were backing out. “After much consideration, we the under signed will not be participating in the CIUT debate planned for Monday,” the statement said. Station manager Ken Stowar said he learned of the withdrawal via media reports. Al Jazeera America, which launched last August with nearly 850 employees and 12 news bureaus in the United States, has laid off dozens of employees as part of restructuring. The channel is disbanding its sports unit and scaling back its social-media-driven show The Stream from a daily show to a once-a-week program, the Hollywood Reporter says. "The majority of people affected were freelancers and many of the staff either came from the sports group or from The Stream," Dawn Bridges, executive vp corporate communications, told The Hollywood Reporter. In a note to employees on Friday, the cable news channel's president, Kate O'Brian, stated that staff reductions were part of a process of restructuring after initial hires were made for the launch. "In the seven months since launch we have built a channel that it took other networks years to do," O'Brian wrote. "As you all know, that required extensive effort, planning and resources. We always understood that we would need considerable resources to meet our goals." "This will have an immediate impact on some staff, freelancers, independent contractors, and other project-oriented individuals who have been with us for several months," O'Brian noted. The cable news channel, backed by the royal family of Qatar, replaced Current TV on the channel guide when it launched on Aug. 20 of last year. A significant investment, up to $600 million, was made in Al Jazeera America, sources told THR at the time. An online poll asking whether victims are to blame for sexual assault triggered immediate outrage from Alberta politicians Thursday. Alberta Jobs Minister Thomas Lukaszuk responded immediately on the social media network Twitter, saying he will urge the government to pull advertising from the Corus radio station. “If your poll is intentional and not a hacked account, I will encourage (the Alberta government) to pull all advertising off of your station,” Lukaszuk said on Twitter. Justice Minister Jonathan Denis also responded immediately. “I say victims are not to blame,” Denis wrote, also on Twitter. The station later issued an apology after the controversy exploded, but the poll remained online. CBS announced Thursday that Colbert, satirically hotheaded host of The Colbert Report, will take over when Letterman — the longest-running late-night host in television history — retires in 2015. The five-year agreement was announced Thursday by CBS Corp. in an e-mailed statement. Colbert will take over when Letterman steps down next year. The CBC told employees Thursday it will eliminate 657 full-time jobs over the next two years as it faces a $130-million financial shortfall. Hubert Lacroix, president and chief executive of the Canadian Broadcasting Corporation, told staffers the broadcaster will also stop pursuing the purchase of professional sports rights and halt any planned local expansion of news coverage. He said the cuts are due in part to the loss of the Hockey Night in Canada rights, which Rogers Communications Inc. won last November, but also due to weak ad revenue and pressure from inflation as its funding from the government is fixed. Veteran award-winning journalist Paul Waldie is the new editor of Report on Business. Editor-in-chief David Walmsley tapped Mr. Waldie, previously European bureau chief for The Globe and Mail. “I’m thrilled to be back at the ROB, the best business publication in Canada,” Mr. Waldie said Tuesday, as he took over the helm of the business newspaper, magazine and digital properties. Waldie is a three-time National Newspaper Award winner in the business category, and won a National Magazine Award. His career spans all aspects of journalism, from business to sports to international reporting. "CBC staff are preparing themselves for bad news Thursday when the broadcaster is expected to announce a major round of job cuts and reductions to services. "Insiders expect the cuts to hit the sales and news departments, but it’s CBC’s sports programming that will likely see the deepest reductions. The broadcaster is scrambling to find a new business model after the devastating loss of NHL hockey, which moves to Rogers’ cable networks this year under a $5.2-billion, 12-year deal the telecom giant signed with the hockey league last year. "The CBC will continue to broadcast Hockey Night in Canada for four more years under a sub-licensing agreement, but all revenues will go to Rogers. "CBC President Hubert Lacroix will hold a series of town hall meetings Thursday to announce the cuts and outline a strategy for bridging a $100-million revenue gap for the year, the Globe and Mail reports. "In some ways, this is the eternal problem of the beat reporter (or specialized writer or critic): When you cover a subject for many years, familiarity can turn into friendship. Cultivating a source over drinks may be one thing; accepting an invitation to Thanksgiving dinner quite another. "Is the latter a good idea? I don’t think so. After all, “outsider” status has helped foster some of the most memorable journalism. (Consider The Washington Post’s Watergate reporting by the young metro-desk reporters Bob Woodward and Carl Bernstein, or the late Michael Hastings’s takedown of Gen. Stanley A. McChrystal.) And, at the opposite end of the spectrum, The Los Angeles Times recently fired a well-regarded investigative reporter after he disclosed an affair with a source." The Associated Press reports that one if its veteran photographers was killed and an AP reporter was wounded on Friday when an Afghan policeman opened fire while they were sitting in their car in eastern Afghanistan. Kathy Gannon, the AP correspondent who for many years was the news organization's Afghanistan bureau chief and more recently was a senior writer for the region, was shot twice and is receiving medical attention. She was described as being in stable condition and talking to medical personnel. Gannon is a Canadian. At least two Rogers-owned publications have dropped their internship programs, the Star has learned. In a pre-emptive move, interns at Flare and Chatelaine who were either unpaid or receiving a $400 monthly honorarium were let go Tuesday. The Ministry of Labour said it has received no complaints and issued no compliance notices for those magazines or others owned by Rogers Communications Inc., one of Canada’s largest corporations. “Moving forward, we want all our internships to be associated with an educational institution or to be paid,” Rogers spokeswoman Louise Leger said in an emailed statement to the Star. As for whether paid internships will be created, the company was “evaluating” its program, she said. Morris Dalla Costa of the London Free Press was asked to leave the arena because Windsor’s basketball team owner had taken offence at something he wrote. The Ministry of the Attorney General is keeping secret the criminal court files of the Brampton courthouse gunman who wounded a Peel Region police officer, the Star reports. Even the reason for withholding the files is being kept secret. On Monday, the Star requested all the public criminal information filed with the Ontario Court of Justice at the A. Grenville and William Davis Courthouse for Charnjit Bassi. Bassi, 45, entered the courthouse on Friday and shot a Peel officer in charge of security, according to preliminary information from the Special Investigations Unit. Bassi was fatally shot by an officer. Paul Schabas, a media lawyer and partner at Blakes law firm, called the ministry’s move blocking public access to court records “outrageous”. “In the absence of a valid statutory restriction (which they should tell you about) or a court order, you have a constitutional right to see court documents and the attorney general has no legal authority to withhold them from you,” Schabas said in an email. “The refusal to let you see court documents flies in the face of the Charter and repeated statements by the Supreme Court.” Schabas said the Supreme Court of Canada has repeatedly made “crystal clear” that the public has a right to access court records. “Sunday Morning Futures with Maria Bartiromo” won its timeslot in its debut Sunday. In fact, the new show beat CNN’s Fareed Zakaria and MSNBC’s Melissa Harris-Perry combined in total viewers in the 10am hour. The show was down slightly in total viewers but up in the demo vs. last Sunday’s 10am offering. In fact, Bartiromo delivered FNC’s third-highest A25-54 number for the timeslot this year.